Are there more buildings and roads near your community thermometer since it was installed? Learn how the leaked emails of ClimateGate explain how scientists hid the Medieval Warm Period (when Vikings settled Greenland) and present cooling - the only way for the present warmth to be "unprecedented". Polar Bears, CO2 Masks, and more! 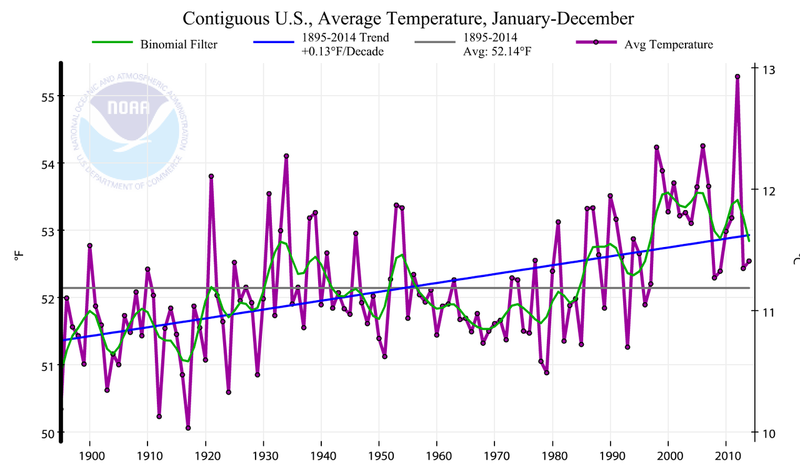 Annual US temps - 2014: 0.5F above 100+ yr avg. 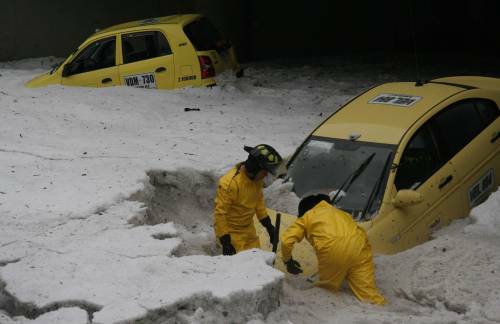 Thousands stranded in Europe by heavy snow:. 16 Bulgarian towns recorded their lowest temperatures since records started 100 years ago. Is the Earth really cooling? Study of the orbital mechanics of the solar system in the 1970s led Russians to believe the Earth was about to cool and we should prepare quickly because it will be catastrophic. Their arguments were lost in the rush to warming group-think in the 1990s, but the arguments for impending cold are well founded and still believed by many good scientists. As the sun goes even quieter and January, 2008 saw the greatest year to year temperature drop ever (128 years of NASA GISS data) and thru the end of 2008 remains relatively cool, it is clear cooling needs to be considered as a very plausible future. This is highlighted by 2 papers published in March 2008. Scafetta and West showed that up to 69% of observed warming is from the sun and remind us that the sun is projected to cool and Ramanathan and Carmichael show that soot has 60% of the warming power of CO2. Both papers state that these factors are underappreciated by IPCC. The soot may well explain the Arctic melting, as it has recently for Asian glaciers. Many scientists believe the temperature changes are more dependent on the sun than CO2, similar to the relationship in your home with your furnace. With the Sun's face nearly quiet, the monthly patterns over the last 12 months are most similar to those of 1797 preceding the Dalton Minimum of 1798-1823 during the little ice age (Timo Niroma). The southern hemisphere has been cooling over the last 10 years, just about as much as the north has been warming. There is no proof within observational data of warming outside of natural variation. When 3 of the highest 5 or 6 years in the temperature record (since 1890) occurred over 70 years ago and 1900 was warmer than recent years in the USA (where the best data are), we are nowhere near statistical proof, nor even evidence of warming. Modelers are still unable to include important variables and no one is able to predict the future. 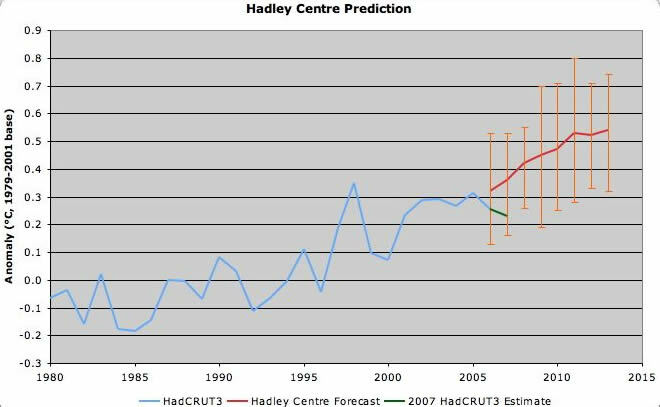 At least Hadley Centre have tried (below). While CO2 continues to rise, the temperature has stabilized at a warm level, but not unusually so. Which way will it go? The world seems to be betting on warming. However, the probability of cooling may be equally valid and we must be prepared for both. Cooling presents the real danger. Things that go up and down only go so high. It has always been this way. Image of current northern sea ice (latest). Check the S. hemisphere sea ice (latest). Virtually all scientists agree that the Earth has warmed a small amount since the year 1000 or, if you choose, since 1850, when instrumented temperature records became reasonably accurate and distributed in key areas of the world. An alternative view, is that the Earth has been cooling since the 1930s when we had 3 of the 5 warmest years since 1860 in the US, and probably globally if the world environmental data base were cleaned up as is happening in the US. This site will be developed to show the science and the impacts related to global cooling, a very scary event compared to warming. It corresponds in the opposite way to the thousands of global warming sites. An unbiased view is at our sister-site: Climate Change Facts. The Editor started his interest in climate change in the 1970s, charged with helping industry adapt to the certainty of global cooling. Tim Ball has documented the cooling trend and its implications. Heavy snow and unusually cold weather have swept across most parts of China this winter, causing travel chaos on roads and on the sea, with forecasters predicting worse to come. 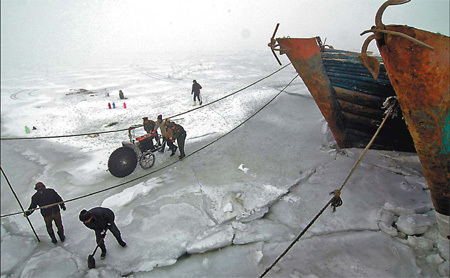 Huludao is facing the worst sea ice in three decades and the sea froze a month earlier than usual. "The sea ice is about 60 nautical miles (110 km) off the coast of Liaodong Bay," Liu Yu, the station's chief forecaster reported. rmer than today, for example, in the time of the dinosaurs (the mid-cretaceous period) when the CO2 was 2 to 4 times greater than today (NOAA). More recently, in the prior period between ice ages, just 125,000 years ago, the Earth also was much warmer than today and the sea level much higher - by about 13 to 20 feet (4 to 6 meters) (IPCC). The primary driver of the past climate shifts is believed to be orbital mechanics and solar variability, with some contribution from Earth geophysical processes, such as volcanic eruptions. It is also known that mankind's contribution to CO2 is just a small percent of the total amount. The Earth's ability to absorb CO2 has apparently been underestimated and the climate models need revision per the 31 December 2009 publication of work by Wolfgang Knorr that shows "No Rise of Atmospheric Carbon Dioxide Fraction in Past 160 Years" (a seminal study). Lastly,, we know that the Earth's temperature and the level of CO2 rise and fall roughly together, but it is not clear (not proven) whether this is cause and effect by either variable. In a first attempt to use a CO2 - based model to predict temperatures, the results are not impressive at all and are exactly opposite observations. Despite what the newspapers say, the cause of the temperature rise, and therefore the future course, is settled only within the consensus group of scientists. This is based on work of computer modelers, believing their increasingly complex models show the cause is due to man's activities and that there will be increasing temperatures according to how much additional greenhouse gases are emitted. TScience News: Chilling Possibilitieshere are many other scientists who are non-modelers, many with backgrounds as atmospheric physicists, climatologists, engineers, meteorologists, and paleo-climatologists, who do not believe the primary cause is mankind, although this could be part of it. Most of these scientists believe that the sun is at the root of the warming (if any), but that other factors are also at work. To help separate fact from fiction, an explanation of these thoughts is included here, along with links to these materials. The chart below is from the Climatic Research Unit (CRU) at the University of East Anglia, which is well respected for its historical databases maintained at the global level, and which are used in IPCC assessments. See the chart for 1860 to present by month, year and quarter by hemisphere. Note that "global" warming is greatest in the Northern hemisphere. Links to similar charts, Hadley composite charts but all slightly different with different assumptions or algorithms to fill in missing or sparse data, are provided in the left margin below. The Japan Met. Agency (JMA) site is recommended because it is interactive and allows you to query the data base. For example, go to the JMA site and try different months, such as August and September. This will confirm the IPCC models that predict more warming will occur during the winter months than the summer. We don't know if this true. This chart looks ominous until put into the context that the average temperature for 1901-2000 is 13.9C (57.0F), so we are talking about a change from about 13.5 to 14.3 C or 56.3 to 57. 7 F. Scientifically, we should use absolute temperatures, which would add an additional 273 C (460 F) degrees. In this context the increase is about 0.3 % Note on the chart that this premier data set puts the observed global warming at 0.42 deg. C (0.8 deg F) above the mean. As seen below, this increase since the mid 1800s is similar to that since the year 1000, although IPCC says the present temperature is likely higher. Greenland ice cores indicate that the start of the instrumented data (thermometers) coincides with a cold period in the northern hemisphere and that at the site of a well-studied ice core (Global Cooling-Doomsday Called Off), the temperature in the mid 1800s was the coldest in 8,000 years. The Global Data are a Mess. For the USA, the trend is less pronounced. Three of the 5 warmest years occurred about 80 years ago and 1900 was warmer than many recent years. 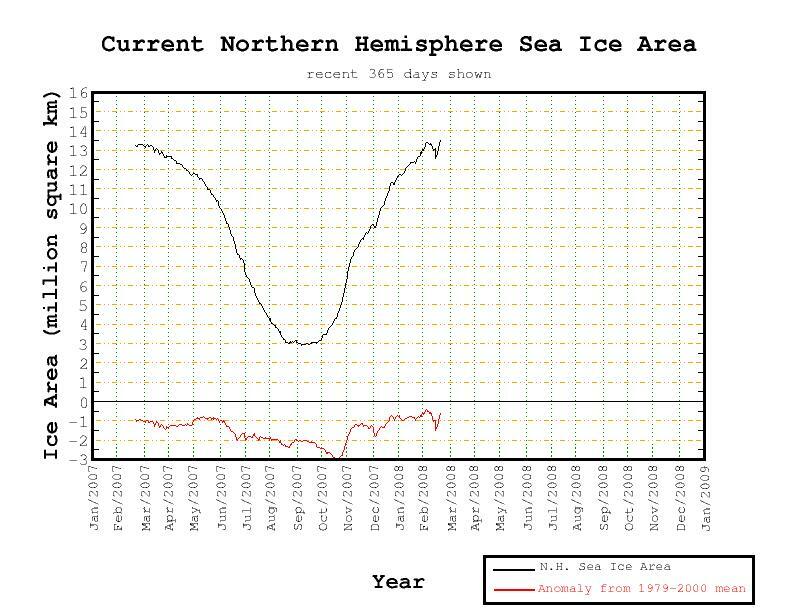 NOAA/NCDC revised data on May 1, 2007 and NASA did so in August 2007. Per NOAA: This new data set uses mostly rural data and algorithms are used to identify and correct extraneous factors such as urban heat island effects. NOAA: "U.S. and global an nual temperatures are now approximately 1.0°F warmer than at the start of the 20th century, and the rate of warming has accelerated over the past 30 years, increasing globally since the mid-1970's at a rate approximately three times faster than the century-scale trend. However, we are still cooler than in the 1930s and several recent years are below 1900. Comment: The use of this new NOAA data set has dropped the temperature increase to 1.0 deg. F (.56 C) from the "improved data set of 2005" which had yielded a rise of 1.12 F. NOAA also says: The global annual temperature for combined land and ocean surfaces in 2006 was +0.54°C (+0.97°F) above average. But in the most recent data NOAA NCDC: "For the contiguous United States, the average temperature for October was 54.5°F (12.5°C), which was 0.3°F (0.2°C) below the 20th century mean, and ranked as the 44th coolest October on record, based on preliminary data." The NASA GISS chart of US data is shown. Our view: It is not clear this is worth getting excited about, given that the benefits of warming likely exceed the detriments and that this rise may be a data artifact, or a mostly natural variation. We believe if the global data set were given equal scrutiny to the US set, global warming would either vanish or be barely detectable. Russian Academicians believe major cooling is imminent. The January 2009 PRAVDA ice-age article is likely vetted by them and the IPCC co-chair. In the prior inter-glacial period about 125,000 years ago, there was no summer ice at the North Pole and the sea level was 15 feet (5m) higher than today. Is this going to happen anyway? Is our temperature just naturally rising and if our own CO2 is helping it along, won't temperature still rise, even when we stop breathing? Resource alarmists believe we will soon run out of fossil fuels. As soon as this happens, it seems, prices will rise and the CO2 problem will simply go away as plants clear out the CO2, that seems to be getting ahead of their ability to remove it. For reason to prevail, as depicted in the GCMs (Global Circulation (or Climate) Models), somebody must know of magnificent petroleum reserves hidden from the prophets of doom. Different parts of certain NGOs (Non Governmental Organizations) ought to get together to get their story straight. If we were to take the IPCC approach, we would look at the literature and note the range of projections and include all these impacts. Doing so would show that the US Energy Information Agency seems alone in showing a growth in oil and gas production for 20 years (limit of projection), driven by increased prices as demand outstrips supply. This is not unreasonable. Other energy advisors in the private sector see a 25% drop in production in about the same period. The projection to the end of the century ranges from sharp reductions to zero output of oil and gas. The reserves of coal are much greater and production will peak later, but soon, within 10 years being often proposed. For most coal producing countries, coal output is in steady decline. Shortages will drive prices making recovery of presently marginal sources and types of fossil fuels feasible. But, it is all a matter of time before CO2 production from all fossil sources declines. The upheaval to society will likely surpass even the most extreme visions of global warming impacts. In March 2008, the price of coal had risen 50% over sixmonths, and the upheavel was documented by the Washington Post. The Earth's ability to absorb CO2 has apparently been underestimated and the climate models need revision per the 31 December 2009 validation of work by Wolfgang Knorr that shows "No Rise of Atmospheric Carbon Dioxide Fraction in Past 160 Years". Sea level rise. For 6 sets of assumptions, the mid-points are about 0.3 meters ( 1 ft.) Since 1850 sea level has risen about 200 mm (9 in. ), a little less than 2 mm/yr. More recently the rate appears to be 3.1 mm/yr, now measured by altimetry satellites. (However, we learned on 22 June 2007 that the data were manipulated to achieve this!!). In a 2009-published study, the authors used GPS measurement to correct for local vertical movement of the Earth at key tide gages, finding a "global rate of geocentric sea level rise of 1.61 ± 0.19mm/yr over the past century" with no acceleration. My specialty is in impacts assessment (oceans, coasts, fisheries, polar regions), not the science of climate change. However, to determine impacts correctly, one must understand the nature of change and its likelihood to continue. It is necessary to have trust in what the climate scientists tell you is going to happen in the future. In the IPCC structure, the science has been led by the UK and US scientists, and they have used modeling as their primary tool, with some paleoclimate analysis coming later. The Impact Assessments have been led by the Russians, who have had an intense distrust of modeling. They viewed paleoclimatology as the most valid tool: if you want to know what will happen when CO2 rises or the temperature changes, they say to look at the history of the earth. As an American, working with the Russian teams, I was often caught in the middle of both camps. I learned to listen to both views, and continue to do so. In particular, we learned to distrust any science literature or impacts assessment that did not consider all data available, whether modeling, the instrumented record back into the 1800s and/or the paleo and historical temperature reconstructions. If the data are truncated, there is likely an agenda. Many of us have learned, either formally, or informally, how to detect misrepresentation by statistical treatments and graphics. Discussions of increased summer heat waves and deaths should also include the reductions of winter cold waves and hypothermia deaths. Discussions of polar bear food contraints must include the impact on the seals and other items they kill. CO2 has usually been associated with temperature rise throughout the history of the Earth. It is indeed a greenhouse gas but it operates on a logarithmic function. 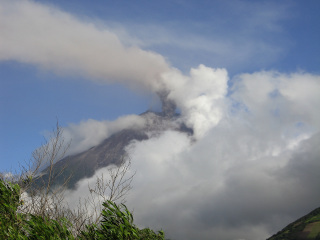 The Earth's natural processes also contribute, and remove, copious amounts of CO2. Since plants first appeared on the Earth, they have converted nearly all available CO2 to oxygen, fossil fuels, and other longterm removals from the atmosphere. Today less than 4/100 of 1% (379 ppm) of our atmosphere is CO2. This pales in comparison with other periods in Earth's history. Common IPCC scenarios rely on an increasing supply of fossil fuels, yet we know that this is not possible and that production will soon peak (if not already) while prices will continue to rise. It is absolutely unrealistic to think CO2 emissions will rise for the duration of this century. In the oceans, major climate warming and cooling is a fact of life, whether it is over a few years as in an El Niño or over decades as in the Pacific Decadal Oscillation or the North Atlantic Oscillation. 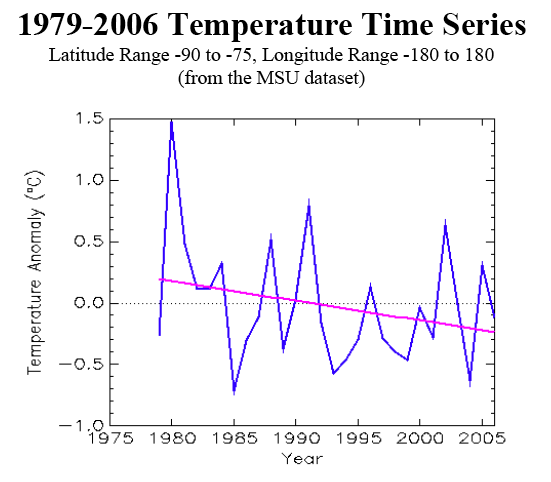 Currents, temperatures, salinity, and biology change rapidly to the new state in months or a couple years. These changes far exceed the changes expected with global warming and occur much faster. The one degree F. rise since about 1860, indeed since the year 1000, has brought the global average temperature from 56.6 to 57.4 degrees F (13.5 to 14.3 C). This is at the level of noise in this rapidly changing system. Sea level has been inexorably rising since the last glaciation lost its grip, and temperatures rose by 10-20 degrees, a mere 10,000 years ago. It is only some few thousand years since Georges Bank was part of the mainland. It is now 60 miles offshore of Provincetown on Cape Cod. Its trees and the shells of its oysters that flourished on its shores still come up in dredges and trawls in now deep water, with the oysters looking like they were shucked yesterday. In the face of all these natural changes, and those we are here to consider, some species flourish while others diminish. These considerations were well understood in all the IPCC groups in which I participated. I have some concerns about some few species near the margins of their suitable habitat range. These include corals near the equator and perhaps polar bears. But I would much rather have the present warm climate, and even with the IPCC’s warming, than the next ice age that will likely last over 100,000 years and bring temperatures much colder than even today. The NOAA PaleoClimate Program shows us that when the dinosaurs roamed the earth, the earth was much warmer, the CO2 levels were 2 to 4 times higher, and coral reefs were much more expansive. The earth was so productive then that we are still using the oil, coal, and gas it generated. In contrast, the last ice age maximum, at just 20,000 years ago saw temperatures 4-7 deg. C (7.6-13.6 F) cooler than present. The one deg. F rise since the 1850s is a relatively small component. 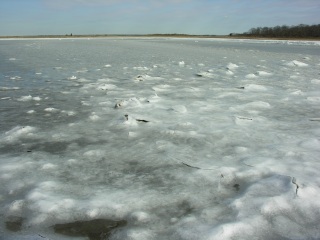 (Photo of frozen North Cove, Fairhaven Mass. in March 2007; courtesy of OceansArt.us). IPCC: Global average sea level in the last interglacial (Eemian) period (130,000-111,000 years ago) was likely 13 to 20 feet (4 to 6 meters) higher than during the 20th century, mainly due to the retreat of polar ice. 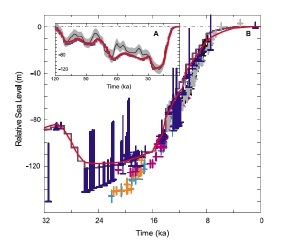 Ice core data indicate that average Arctic temperatures at that time were 5.7 to 9.5 deg. F (3 to 5 deg. C) higher than present, because of differences in the Earth’s orbit. The Greenland ice sheet and other Arctic ice fields likely contributed no more than 13 feet (4 meters) of the observed sea level rise. There may also have been a contribution from Antarctica. Note in the chart how the rate of sea level rise is very low compared to that when the ice age wanes. 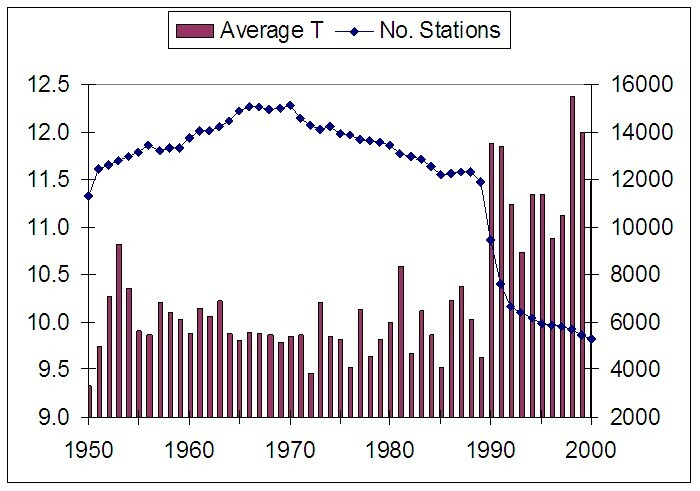 (Chart/text IPCC 2007). Dr. Nils-Axel Mörner (leading expert on sea level): "If you go around the globe, you find no rise anywhere. But they need the rise, because if there is no rise, there is no death threat. They say there is nothing good to come from a sea-level rise, only problems, coastal problems. If you have a temperature rise, if it’s a problem in one area, it’s beneficial in another area. But sea level is the real “bad guy,” and therefore they have talked very much about it. But the real thing is, that it doesn’t exist in observational data, only in computer modeling." Dr. Mörner's credentials. In a 2009 study, using GPS measurements to correct for local vertical movement of the Earth at key tide gages, finding a "global rate of geocentric sea level rise of 1.61 ± 0.19mm/yr over the past century". 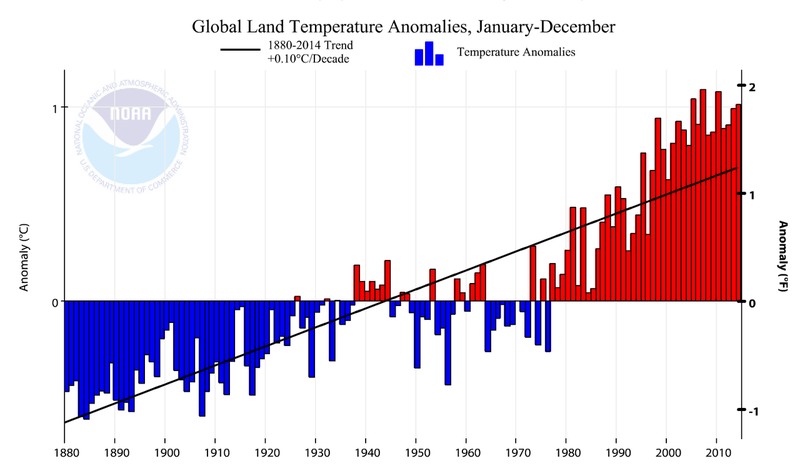 Their study shows no acceleration and no changes in rate during warm or cold periods of the last 110 years. It is virtually a straight-line rate of increase, independent of Earth's temperature. We should respond prudently to the threats from climate change. These actions should include things that make sense in their own right and which will be important whether the Earth warms or cools in the near future. In the distant future it is a certainty that the Earth will warm beyond what we have today and that the next ice age is waiting in the wings, but not for another 30,000 years or so, according to our present knowledge of solar variability and orbital mechanics (IPCC 2007). If we are concerned about global warming, a guiding principle is to do things that yield a cost savings or are neutral. Overall, we should aim to reduce our cost of goods sold and, at the consumer level, our living expenses, while at the same time "cleaning up our act". What should we do now? See Ways to Improve Energy Efficiency and Energy Sources. We also have a mixture of half serious and tongue-in-cheek ideas to halt climate change.) All of us should lead by example, and as much as possible, within the market place, while keeping our personal freedoms we hold so dear. One way to check? Look at your household energy consumption. It is reasonable to have it drop one percent every two years for as long as you have been in your house, just from household maintenance, appliance replacement and replacing light bulbs with fluorescents or LEDs when they burn out. All lights on timers, for example, should be fluorescents (See cflsafety.blogspot.com for a review of safety concerns). Do we adjust the thermostat for when nobody is home? Is our shower just a little too long? Perhaps the biggest example would be in not begetting more children than is socially responsible. See our list of ways to secure energy sources, improve efficiency and alternative energies. Should not commit to actions that put us at a disadvantage, whether it is the Kyoto protocol or some other vehicle Increase our taxes on fuels (e.g., a carbon tax) that are inputs to production and services. If a taxing regime is implemented it must separate production uses from consumption. Sensationalist press not counteracted. The fact that Antarctica is warming in the area nearest Chile gets heralded, but the IPCC science documents show that, as a whole, Antarctica is stable. Flooding of coasts and cities, attributed to warming, is not countered by the IPCC, even though its science document shows no discernible acceleration in the rate of rise, a solid indicator of warming and necessary for prior sea level projections. Influence of the Sun. Scientists affiliated with the Consensus believe solar influences are not important to the recent warming and that are actually in the wrong direction (See recent paper by Lockwood and Frohlich). Other scientists believe that the analysis is flawed and that the actual mechanisms through which the Sun affects Earth climate were not used in the analysis (for example, Whitehouse). Solar mechanisms, not used in climate models, include several cycles of a few to hundreds of years. When superimposed, they have profound warming or cooling effects. MAny solar scientists believe that most of the Earth's temperature variation is explained by the sun's activity and our proximity to it (Scafetta and West). Disproportionate Press Coverage. Consensus scientists and their allies decry all the attention the Skeptics get, when they are so few. Perhaps they are perceived to be so few because Consensus people do not see them in the room and do not realize how numerous they are becoming. Conversely the Skeptics have reached critical mass and, not seeing any consensus members in their own midst, see themselves as the true consensus. Of course, the press loves a controversy. It, along with fear, are two primary attributes that expand the audience. If anyone believes the Skeptics are some tiny minority, try using your favorite search engine to search for climate skeptics. The search will show dozens or hundreds of pro and con Skeptic arguments and websites. It will show some of the hype and hysteria on all sides of the climate arguments, as well as legitimate scientific sites and discussion forums. The IPCC 2007 Reports Suggest There Will be More Losers than Winners with Warming. Imagine what they would say with global cooling! The IPCC process includes many unlikely warming scenarios. These worst-case estimates also have associated impacts, from benign to worst-case. Thus we get the 5% worst impacts that have a 5% chance of happening (a combined 0.25% likelihood) equally discussed with benign changes that are reasonable to expect. By the time summaries are written, and press releases, only the bad effects are presented. This leads to a gross exaggeration of the problems. Global Warming Will Actually Have More Winners then Losers. Global cooling does not. Throughout the history of human life, the Earth's livability has always been better when the climate has been warmer than cooler. Human populations have expanded the most when the Earth warmed and turned greener, whether during the middle ages or during the last 2 decades. Whether it is a fish in the ocean, a shrimp in an aquaculture pond, or a bean on a vine, it will grow faster when it is warmer, all things being equal. Humans will be quick to take advantage of a warmer climate and to adjust if it gets too warm in an area. More crops grow where it is warm or hot than in frozen ground, and CO2 is a primary food of plants - basic facts that seem forgotten. Even now, NASA satellites show that the Earth has become 6% greener as the world has warmed over the past 20 years: "Our study (NASA) proposes climatic changes as the leading cause for the increases in plant growth over the last two decades, with lesser contribution from carbon dioxide fertilization and forest re-growth" . Further, a May 2007 Nature paper shows that precipitation increases 6.5% per degree C rise, not the 1-3% used in models, making the Earth 3X wetter than models forecast. Deserts, as is known for prior warm periods, will be wetter, not drier. In the warm coastal farm lands near Guayaquil, Ecuador (near the equator) are many greenhouses, and in the cooler elevations, they are everywhere. This makes it clear how bad warming might be for agriculture. Polar Bears have Endured Warmer Periods than are Forecast by IPCC. They evolved into their present form some 700,000 years ago (or 100,000 years ago) (or 200,000 years ago) (or before the beginning of the last interglacial) and their molars changed some 10,000 to 20,000 years ago. Importantly, polar bears were likely present in some final version of their present form, during the last interglacial (130-110,000 years ago), as late 2007 research indicates, when there was virtually no ice at the North Pole and average Arctic temperatures at that time were 5.7 to 9.5 deg. F (3 to 5 deg. C) higher than present (IPCC, 2007). This date of evolution should be determined factually, as a first step, before taking action. If polar bears survived the past interglacial, the present warming may be of little consequence. In any case, the 20 polar bear populations need to be looked at individually, in terms of their threats and adaptability, and the management systems that govern their conservation. Imagine if it were so cold, there were no edges for the polar bears to hunt, and with the increased energy demands, there would be major reductions in populations.
. The press trumpeted this every few days in the summer of 2007. Further down the page on the monitoring sites of major institutions was some additional news. Antarctic ice coverage at the same time was at or above the highest levels ever recorded. For example, see the University of Illinois Cryosphere Program. In each case, reliable measurements date only from the arrival of satellite data in the 1970s, another usually omitted fact. However, since the Northwest Passage was open to sailing vessels and explored in 1903-1905 (Gjøa/Roald Amundsen), and again in 1940-42 and 1944 (St. Roch), it is possible this recent reduction in Arctic ice is not an indicator of warming. The return of Arctic sea ice in 2008 to levels at lest 30% greater than 2007 received little attention. In April 2010, the ice extent was 3.4% below average. New York Times May 5, 1946 - Top of the World (book review includes NW passage made during WWII). Need subscription or pay. New York Times Feb 20, 1969 - Arctic Ocean Will Soon Be an Open Sea. Need subscription or pay. Snow shuts hundreds of schools in New England, after snowiest Dec. Snow sets New Hampshire record. The old record was set in 1876 and Chicago snowfall at double the 30 year average. Argentina November frost devastates agriculture. 10% of wheat lost (Español). Half of all warming since 1900 is due to sun say Duke University and US Army researchers (Nov 2007). The rest poor global data. Buenos Aires records its lowest temperature for November in 90 years, 2.5 deg.C. (Nov 2007(Español)).